Alcohols play a pivotal role in organic synthesis because they are ubiquitous and can be used in a variety of well-established transformations. However, in C-C bond formation reactions, despite being central to organic synthesis, alcohols are mostly employed in an indirect fashion. Many alcohol-based reactions necessitate tedious pre-transformation of the hydroxy group (C-OH) to other functional groups such as halogens (e.g., C-Br) before C-C bond formation (Figure 1). The development of one-step C-C bond formation reactions using alcohols is highly desirable because it realizes the application of ubiquitous materials without the burden of a multiple-step procedure. One way to achieve this goal is to directly convert alcohols to known reactive intermediates that instantly undergo C-C bond formation reactions. We envisioned that we could achieve this using low-valent titanium reagents. Low-valent titanium is a one-electron reductant and a highly oxophilic species. 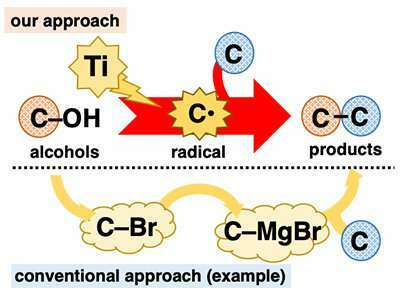 Because of these features, it is expected that low-valent titanium could extract an oxygen atom from alcohol, cleaving the C-O bond in a one-electron reduction to generate the corresponding carbon radical (C* ). The carbon radical is an extremely reactive intermediate that readily undergoes diverse reactions, including C-C bond formation. Treatment of 2-naphthalenemethanol with a low-valent titanium reagent afforded a mixture of two C-O cleaved products from hydrogenation and dimerization (Figure 2). These reactions themselves were not very useful; however, they were both evidence of the generation of benzyl radical species. 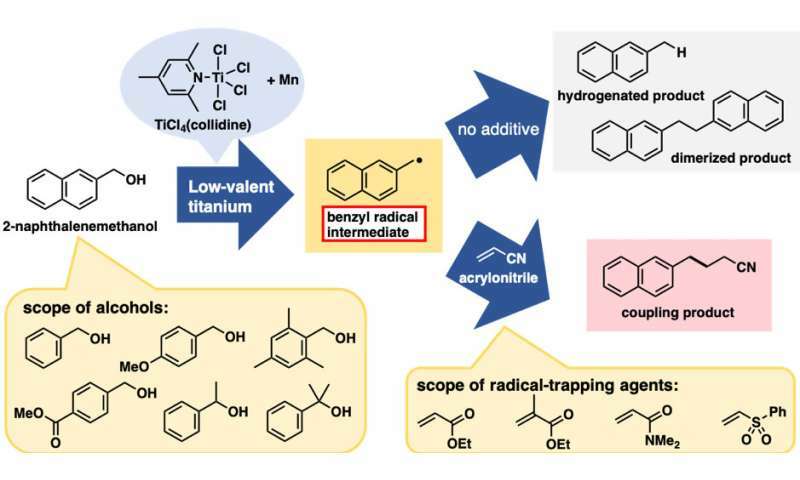 With this preliminary result, we expected that adding radical-trapping agents would afford the coupling products between the benzyl radical and trapping agents, interrupting the hydrogenation and dimerization reactions. Indeed, the addition of acrylonitrile as a trapping agent gave the coupling product between the benzyl radical and acrylonitrile as the predominant product. The best result was obtained when the low-valent titanium reagent was prepared from TiCl4(collidine) and manganese powder. This alcohol-based direct C-C bond formation reaction was successfully applied to a series of benzyl alcohol derivatives. Remarkably, both benzyl alcohols with electron-donating and -withdrawing substituents on the aromatic ring were suitable for this reaction. Furthermore, in addition to primary alcohols, secondary and tertiary alcohols were also suitable despite the considerable increase in steric hinderance. Several electron-deficient alkenes other than acrylonitrile were also good reactants. With respect to practicality, this reaction is cost-efficient and easy to conduct, at least on a laboratory scale. TiCl4(collidine) is stable during storage, tolerant to brief exposure to air, and costs only approximately 10 JPY/mmol. The significance of this method is that it enables direct use of alcohols as carbon radical equivalents. We have linked ubiquitous alcohols with accumulated knowledge about radical reactions. We believe that this work will prompt research into other alcohol-based radical reactions in the near future.